Bible verses about peace are so important. When you feel stressed or you’ve had to deal with a tough situation it helps to read these passages. In this world of war and turmoil it is good to turn to the Bible and see what God has to say about peace. The first five scriptures are scriptures that you probably have heard before. The next five are some of my favorites that might be new to you. 2 Thessalonians 3:16 "Now may the Lord of peace himself give you peace at all times and in every way. The Lord be with all of you." Psalm 34:14 "Turn from evil and do good; seek peace and pursue it." Philippians 4:6-7 "do not be anxious about anything, but in everything by prayer and supplication with thanksgiving let your requests be made known to God. And the peace of God, which surpasses all understanding, will guard your hearts and your minds in Christ Jesus." Mark 9:50 "Salt is good, but if the salt has lost its saltiness, how will you make it salty again? Have salt in yourselves, and be at peace with one another." Romans 12:18 "If it is possible, as far as it depends on you, live at peace with everyone." Proverbs 16:7 "When a man's ways are pleasing to the LORD, he makes even his enemies live at peace with him." One of the main things that I think about when I read these Bible verses about peace is that so many of them are about being peaceful with those around you. Just take a drive down the interstate or in a city and you will see how little peace people have in their lives. There are people cutting others off, honking, making obscene gestures, etc. What would happen if we all were to commit to living at peace with each other? I think we would not only see a difference in the way we treated our neighbors and family but also see a difference in the way countries treated each other. I think that is what these Bible authors are trying to get us to see in these Bible verses about peace. I think that one of the reasons it is so hard to make peace work is because both sides have to give up something. They have to put themselves aside and think about the other person. So much of the time we are just out for ourselves and looking to take advantage of others to get ahead that we don’t want to be at peace with others. That would mean that we have to give up what we have gained from them. 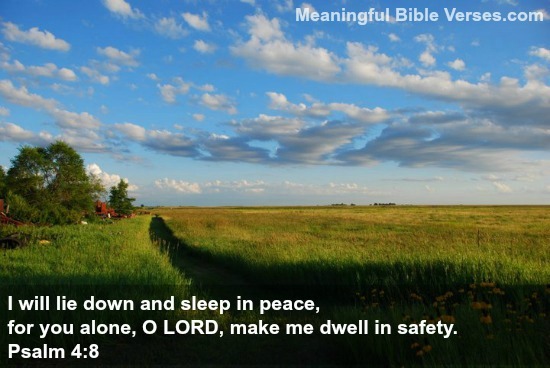 It seems that these peace bible verses are saying that it is important enough that we should make it a priority in our lives. The only way to get more people to change is to become more peaceful ourselves.